Bourbon and hot chilis make this mild, medium, and hot trio stand out from the tomato condiment crowd. We tend to take ketchup for granted. It's always just...there. These ketchups, though—they're born stars. 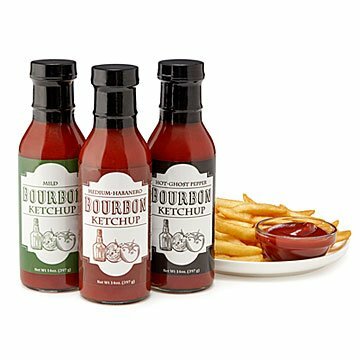 Their tomato flavor, delicious to begin with, is deepened by bourbon, which is aged in charred oak barrels. The wood sugar caramelizes, imparting a sweet smokiness to the liquor. All that goes into the ketchup bottle. Mild is irresistibly sweet and savory, bringing next-level yum to anything you put it on. Thanks to some habanero, Medium has a noticeable, but manageable, kick. The Hot, with habanero and ghost pepper, will not disappoint those who love real heat. A touch of hickory smoke makes it extra delicious. All are good on eggs, veggie burgers, fries. Mixed with mayo (or not), they make sandwiches extraordinary. Made in Athens, Ohio.